Vancouver, B.C. (TSX.V: TXR; OTC Pink: TRXXF; Frankfurt: TX0 - http://www.commodity-tv.net/c/search_adv/?v=297281) is pleased to announce that a property wide exploration program is now underway on our Yellowknife City Gold project ("YCG"), immediately adjacent to the city of Yellowknife in the Northwest Territories. As a result of the recently announced 290 square kilometre increase in TerraX’s land holdings, the company now controls triple the size of the land position it held in December 2016. Joe Campbell, the Chief Executive Officer of TerraX, states "As a result of our continued drilling success, improving market conditions and the ease of access to exploration adjacent to a mining town we have tripled our land holdings at Yellowknife to over 418 square kilometres. We are excited to have a district scale exploration project over a known major gold camp, where over 14 million ounces of gold has been produced from just two mines near Yellowknife, the Con and Giant. Our drill programs to date have been successful; however, we see a much bigger opportunity for a district approach based on the larger land package. TerraX has just completed a high-resolution airborne Lidar and ortho-photo survey on the property covering approximately 350 square kilometres. In the next few weeks, TerraX will be conducting electro-magnetic, magnetic and radiometric geophysical surveys totally approximately 3,200 line kilometres over all areas of the project that have not previously been surveyed. In addition, ground-based magnetic surveys will be conducted in areas of known high grade gold mineralization to identify drill targets that could expand the zones along strike and at depth. Field work already underway on the newly acquired Eastbelt property has included comprehensive field mapping and sampling of historic trenches in known areas of gold mineralization, with over 400 samples having already been delivered to the assay lab for analysis in the first 10 days of field work. This work will continue throughout the summer and be complemented by an extensive till and lake sediment sampling program to provide a comprehensive dataset to identify mineralized trends in areas of the property covered by overburden and water. This will allow us to better prioritize drill targets and more effectively deploy our exploration resources. For a map of the complete Yellowknife City Gold project area, please click here. TerraX is also pleased to have once again been awarded a $200,000 Mineral Incentive Program (“MIP”) grant by the government of the Northwest Territories, the maximum amount available to any one project under the program. The MIP was put in place to actively encourage mineral exploration in the Territories. The support shown through the MIP is seen by TerraX as a progressive move by the NWT government to sustain mining as an important economic driver in the NWT economy and demonstrates their long-term commitment to the industry. 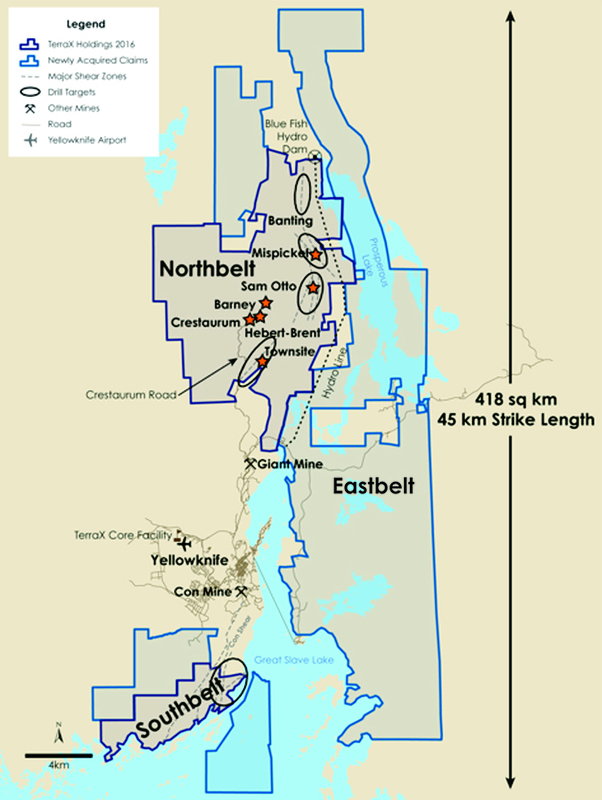 The YCG lies on the prolific Yellowknife greenstone belt, covering 45 km of strike length along the main mineralized break in the Yellowknife gold district, including the southern and northern extensions of the shear system that hosted the high-grade Con and Giant gold mines. The project area contains multiple shears that are the recognized hosts for gold deposits in the Yellowknife gold district, with innumerable gold showings and recent high grade drill results that serve to indicate the project's potential as a world-class gold district.